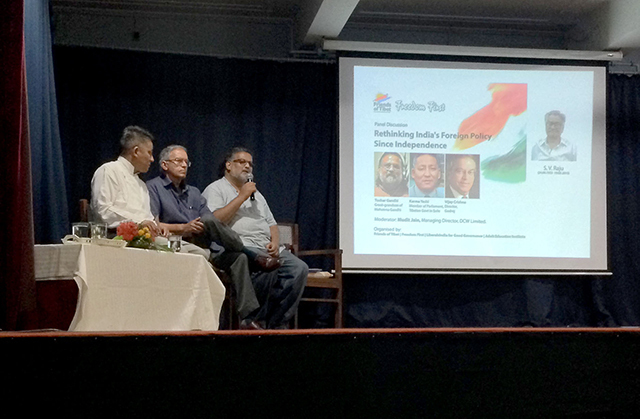 "Rethinking India's Foreign Policy Since Independence"
Mumbai: Organised by Friends of Tibet and Freedom First, "Rethinking India's Foreign Policy Since Independence" discussion was held at The Alexandra Girl's English Institution, Mumbai on May 19, 2016. The event was organised as part of the first death anniversary of Shri SV Raju, one of the long-time supporter of the Tibet cause. Prof CP Narayan rendered in his soulful voice — "Om Mani Padme Hum". Kashmira Rao, Executive Secretary, Adult Education Institute welcomed the audience. She read out the article on Tibet written by SV Raju in 1959, which was his first on the subject, written a month after His Holiness the XIV Dalai Lama had to seek refuge in India. Not much has changed in the last 59 years! She quoted what late SV Raju said during the 2014 Human Rights Day event organised by Friends of Tibet, which was the last public programme on Tibet in Mumbai "I may not live to see a Free Tibet, but the struggle must go on". Mudit Jain, Managing Director, DCW Limited moderated the panel discussion. He shared his travel experience to Western Tibet. He cited how the travel group was instructed by the Government of India to keep their mouth shut and shared how the region they visited was completely dominated by the Chinese. He felt that India's Foreign Policy of pleasing all, ends up pleasing no one. Mudit Jain introduced the panellists — Tushar Gandhi, Karma Yeshi and Vijay Crishna to the audience. 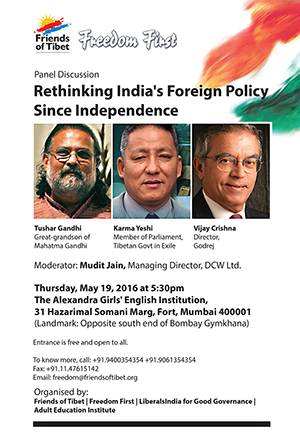 Rethinking India's Foreign Policy Since Independence panelists: Karma Yeshi, Member of the Tibetan Parliament in Exile, Vijay Crishna, Director, Godrej, Tushar Gandhi, great-grandson of Mahatma Gandhi. Vijay Crishna, Director, Godrej, enthralled the audience with his presentation on the subject. The 40-minute presentation took the audience on a visual journey from the aftermath of the World War II to the current political situation in Tibet and our policy blunders. He started his presentation by showing how we human beings used to deal with each other at peace, staying together facing nature. Over a period of time staying together got more complex and we unleashed new technology to harm each other. He further quoted TS Eliot's Poem 'Burnt Norton". The presentation focussed on the rise of Cold War, end of Hitler era and beginning of new super power and the usage of psychological war. Vijay Crishna went on to explain how Mao, the Master Strategist, that he was, was able to sneak into Tibet when the world's focus was on South Korea. He explained how Mao sought the permission of Stalin and as per his advice Mao captured Tibet which was a stroke of his genius. He went on explaining how it was indeed a peaceful intrusion with the natives welcoming them. The strategies of the wily Mao including the 'Hundred Flowers Campaign' which was cleverly used to flush out dissidents. "Chinese began building roads through extremely tough terrains. The People's Liberation Army which was portrayed as a Volunteer's Army earlier was instructed to win over the natives. It was rather peaceful. It was a Great Leap Forward!" Rapid industrialisation shrunk the Chinese economy, in the process it resulted in the death of 35 to 50 million Chinese people. The 'Great Proletarian Cultural Revolution' from 1966 ending in 1976 with Tiananmen Square massacre saw Mao spreading his claws and imposing his ideology across the country and destroying all detractors. Over 70 million Chinese people were killed by Mao and this resulted in chronic malnutrition and rise of cannibalism and in the meanwhile the destruction of Tibet was complete! Though the Tibetans were banned from usage of His Holiness the XIV Dalai Lama's photo in public or in private, His Holiness was enshrined in the minds of Tibetans. Meanwhile Independent India saw its first scandal in 1948 — the Jeep Scandal. The then British High Commissioner, VK Krishna Menon bypassed protocols and signed the 80 lakh contract for the purchase of Jeeps with a foreign firm. He was under the scanner of both CIA and MI5, but his equations with Pandit Nehru overlooked all his misdeeds. The great Indian leader Sardar Patel wrote to Pandit Nehru, but there was no action, but rather VK Krishna Menon was appointed a minister without portfolio and later made India's Defence Minister! Nehru little realised how much his inaction would cost the country both in terms of money as well as the country's prestige. Nehru never understood Mao; though he had visited China in the 1930s, Nehru did not visit Mao until the 1950s. Nehru believed that borders were merely lines in the map which could be negotiated across table. He forgot how British used 1914 Shimla Accord. Mao would have loved that line — Arunachal Pradesh not a part of India! Vijay Crishna shared the video of the 'First Flight to Leh' shot by Serbjeeth Singh as per the instructions from Major General Thimayya who happened to be his uncle. General Thimayya had suspected that China was building roads to India and he engaged Sydney Wignall to produce clinching evidence about the same, but it fell on deaf ears. Later Pandit Nehru told that Krishnan Menon never gave Gen Thimayya's report! All this while the government was under the impression that the real threat was from Pakistan, and Nehru coined 'Hindi Chini Bhai Bhai'! Mao resolved to humiliate. China would walk in and slap our face and walk back and Indian armies were equipped with PT shoes! Successive Indian Governments have been appeasing China! Vijay Crishna shared a painful incident wherein during one of his trips to Chinese-occupied Tibet, he watched a local programme in a TV channel in which China referred to India in the Female Gender. Karma Yeshi, Member of Parliament paid tribute to Late SV Raju who was a supporter of the cause throughout his lifetime. He said Late Shri Raju wrote the article on Tibet much before he was even born. "My parents came from Tibet. I was born in the roadside at Gangtok. I have never seen Tibet, only read about it. I am more an Indian. I thank people of India to help us continue and preserve our culture as refugees in India, but back in Tibet we are not allowed to do so." Tibet is the roof of the world. When there is a leak in the roof, one has to seal it. When Tibet was a free nation, it acted as a buffer between China and India. Peace did exist. In 1951, the People's Liberation Army of Mao invaded the eastern part of Tibet. Nepal colluded with the Chinese and even in Nepal, Tibetan people cannot practise Tibetan culture, all because of the influence of Red Dragon. Karma Yeshi went on to add that culturally Tibetans were children of India as Buddhism originated from India. In Tibet Chinese is the main language, not Tibetan. Buddhism replaced with communism. Karma Yeshi spoke about the respect and command that His Holiness the XIV Dalai Lama has amongst Tibetan and Chinese. His Holiness is revered by several Buddhists inside China and has a huge follower base inside China. The Dalai Lama is the key who can play a great role. He went on to add that inside Tibet, people of his age know better Chinese, and less Buddhism. In 2008 there was a huge protest inside occupied-Tibet and from then, people are not allowed to protest. Since then 144 Tibetan women, men, old and young, lamas have self-immolated. They could have indulged in violent practises by bombarding Chinese establishments, but they chose non-violence and did the ultimate sacrifice by immolating themselves. Taking video footages of the self-immolation and leaking the news to the outside world, brave Tibetans inside are risking their lives. The present generation inside Tibet have not seen the Dalai Lama, but are patriotic in their hearts. According to him the main role of the Government in Exile is to spread the message and make issue and garner support from other nations, but the issue is ignored. The Tibetan Issue is not pertaining to Tibet alone. Tibet is the Water storehouse of Asia. Tibet is considered to be the third pole after Artic and Antarctica; but the third pole is now melting. Foreign Policies which is supposed to be based on relationship is now overshadowed by money power. Karma Yeshi stressed that the root of the Tibetan Movement is from India and Thanked India for the same. Tushar Gandhi, Great-Grandson of Mahatma Gandhi started by saying he need not be diplomatic since he is not a part of the Government of India, neither he is a scholar hence cannot be scholastic. He further asked the audience "How can I speak on something that never exists". "What to talk about something that exists only in some people's imagination. Nehru had the courage to offer shelter to His Holiness Dalai Lama, I doubt if any other leader from the current or past governments would have similar courage". He asked what freedom the Tibetans enjoys in exile, when they are not allowed to protest against China whenever someone comes from China! This spoke volumes about our Foreign Policy, which is dictated by China! Tushar Gandhi spoke about the recent cancellation of Visa to Dolkun Isa thus, "A person known to be a suspected terrorist is granted visa, he comes plans the attack and leaves uncaught (David Coleman Headley, the US agent who conspired with the Lashkar-e-Taiba in plotting 2008 attacks on Mumbai), but a person accused to be a terrorist by the Chinese is cancelled Visa due to compulsion from the Chinese". Indian Foreign Policy is all about not antagonising other nations, but maintaining status quo. Non-alignment movement is not honest to the ideals of what it meant and formulated. Tushar Gandhi asked, "Where is the Foreign policy that looks after Indian Interest!" China goes ahead and portrays a wrong map of India and there is no provocation from us. Fictitious lines more valuable than ground reality? We successfully pushed Nepal to the Chinese. What about the strategic interest of India? National Security Act forgets the importance of Indian citizens to know what Indian Government does on this front. Commenting on how outrageous comments were example of political wit in the past, he cited that when TT Krishnamachari, the then Finance Minister called Feroze Gandhi a 'Lapdog' of the Prime Minister, he responded with élan "Sir, you are a pillar of society. And today I will do to you what a dog does to a pillar." This he said, can never be expected in modern days. He went on to add how we were able to fool when Indira Gandhi campaigned around the world after Pokhran I citing it was done for peaceful purpose. But during Pokhran II we legitimised Pakistan holding nuclear warfare! We still go on bending our knee to sign nuclear policy! We have a Foreign Minister in the garbs of Prime Minister who goes around celebrating each foreign visit like it were Independence Day or Republic Day; when he should be looking after the betterment of Indians in India. They (Chinese) interfere in our country, but we cannot! This signals how serious we are about foreign policy. Questions needs to be asked and debated. Instead of demanding our rights like a beggar we ask for United Nations Seat. This is what happens when we do not have a proper strategised Foreign Policy. Ever since Independence, during all bilateral international issues, Pakistan has always stolen and walked away with glory, painting us to a corner whenever a treaty was attempted; he stressed he is not condemning the Foreign Policy of the current government, but the ones since Independence. Tushar Gandhi stressed that this is the tragedy of India, Independence of Tibet would be victory for India, but we are not worried. We claim to be a Super Power, but in reality we struggle to maintain relationships with countries with whom we share our borders. Our neighbours do not respect us and we struggle to maintain a friendly relationship. The Dragon is snarling right down on our face, have gone right around us and exploited our neighbours, yet we think all is well! In reality we only have the protection of the Himalayas. They have partnered with Sri Lanka, have gone with Pakistan, because with both the countries, our Foreign Policy is a disaster. Tushar Gandhi concluded by saying that rather than relying on a Government which does not care about the interests of its citizens, we need to create people to people, organisation to organisation groups. We who consider ourselves as liberals and seculars, we always tell that this is the land of Gandhi, but nothing has changed; the first twenty years proved us so wrong. About what he discussed, he opined, something might sink in, some might not, but he emphasised that it's vital that we are aware of the situation. And a very interactive question and answer session followed. Vijay Crishna: We are talking about a psycho country in which 70 million people died because of mistake and wrong action by one person, I do not have an answer. Tushar Gandhi: We share a culture of feudalism with China. And we are proud of a democracy corrupt by feudalistic ideology. We need a strong and culpable leadership. Karma Yeshi: Freedom will not come without sacrifice. We have to sacrifice. We have to hammer the nail properly. It's not long before plates will turn. We should work towards bringing democracy in China and it's important to us. Time will definitely come. We have to work together. We need support, we cannot do alone. Tushar Gandhi: Made in India campaign being done from China tells a lot. We claim to be a super power, why try to copy someone instead of writing our own success story. Vijay Crishna: Over the years we have seen changes in Monsoon. How Monsoon is going to be here would be an after effect of what's happening in Tibet. Tushar Gandhi: Mumbai NEZ has opened up. Western Ghats opened up for industrialisation, and we keep quiet! Sethu Das, President, Friends of Tibet honoured the panellists and the moderator and thanked Prof CP Narayan for his soulful rendition of "Om Mani Padme Hum" and his contribution to the cause. Rohit Singh, Campaigns Coordinator of Friends of Tibet, proposed Vote of Thanks. Kashmira Rao remarked how Late SV Raju would have liked Mudit Jain's moderation as Raju used to moderate programmes himself because most of the times the moderators were found to be not being strong in their moderation. Discussion Theme: Friendships and relationships are as old as mountains and rivers. Ancient texts talk about the existence and management of diplomatic ties from time immemorial to sort issues that arise between different societies and individuals living in groups. Business dictionaries define Foreign Policy as "a plan of action adopted by one nation in regards to its diplomatic dealings with other countries". Foreign Policy and Affairs of a country is closely integrated with fundamental security and developmental priorities based on its relationship with other countries. In theory, one of the primary functions of a country's Foreign Policy is to safe-guard its national and regional interests. By cancelling visa to Dolkun Isa, leader of World Uyghur Congress and Chinese pro-democracy activists from Hong Kong and Tiananmen Square Movements who were invited guests for a conference organised by Initiatives for China, India has once again accepted the definition of 'terrorism' by China, one of the most brutal regimes in the world. The host country has also surrendered its national interest and dignity while appeasing some of the neighbouring countries. In the wake of recent incidents, diplomatic blunders and U-turns, it is necessary for members of the civil society to reflect upon the question of the "Effectiveness of Indian Foreign Policy and its long-term implications on its relationship with hostile and friendly nations."